I promised the Black Gate folks a review of the pdf version of Black Gate #14 and with all the excitement this summer it took me longer to read it than I had intended. Many apologies for the lateness of this. 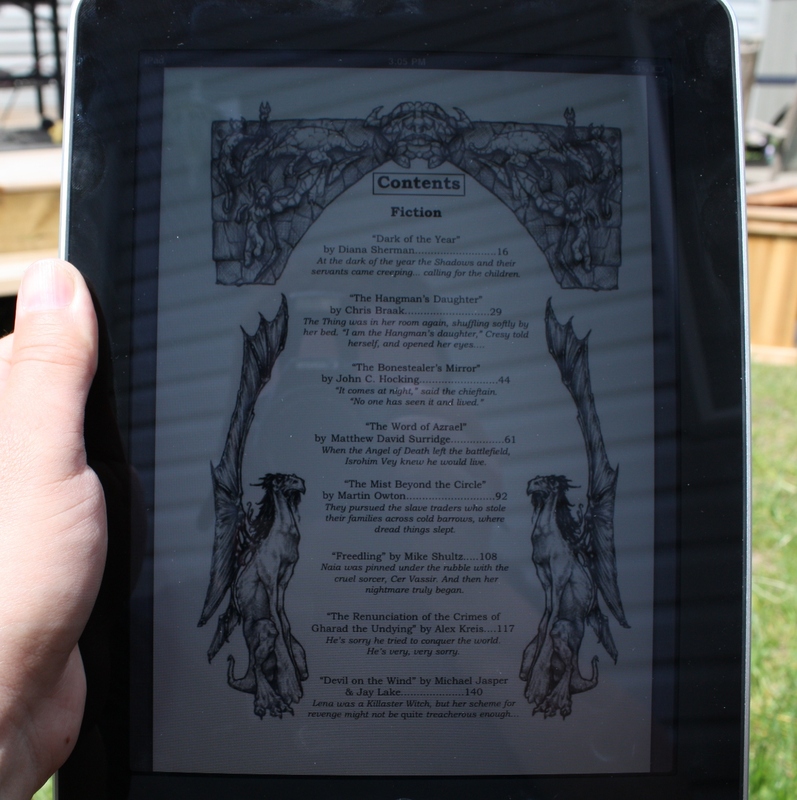 Earlier in the year I changed my print subscription to Black Gate into an electronic one. This was done mostly to save postage expense, I love the print magazine and have every issue and so this was my first time reading it digitally. I transferred the PDF through the iTunes Books folder and read it using the iBooks app. As you can see the text and images look sharp on the iPad. There’s reflection but it was a bright sunny day, probably the worst possible reading conditions and it still was pretty easy to read. About the only difficulties I encountered were with the two-column layout that appeared for longer stories (most stories were single column). The two-column stories and articles were more of a challenge to read because the text became rather smallish (yeah I know… my eyes are getting old). There might be a setting in the pdf viewer to adjust for that but I couldn’t find it. So all in all I’m pretty happy with reading Black Gate this way. I’m hoping Apple adds some improvements to the pdf viewer (I can add annotations to normal iBooks but not to pdfs, for example) but as it stands now it is more than sufficient. I always look forward to issues of Black Gate (wish it came out more frequently but if you read the entertaining editorials you’ll understand why that doesn’t happen). While primarily adventure fantasy it usually has a range of story styles and genres (this issue was mostly fantasy with a couple modern/western-fantasy stories) and all the stories are very well executed. I’m not as interested in the articles but they are well done (though the historical examinations of fantasy and sci-fi do make me feel guilty for not being better read in the ‘classics’). This was a huge issue. I’m not going to do an individual story by story review (there were 19 stories and several articles too!) I enjoyed every story, some more than others. Many stories are carried by enjoyable and personable characters (and several are part of ongoing series with those characters). Other stories show fabulously detailed world building, really drawing me into the universes the authors have created. Others have clever plots or outrageous events. And many do all of this well — great characters, engaging world, strong plot. I will mention THE REUNUNCIATION OF THE CRIMES OF GHARAD THE UNDYING by Alex Kreis — I thought this very funny and I normally don’t like humor stories and through his written apology to the peoples he has oppressed you see snippets of clever world building and more. Nicely done. I also really enjoyed THE WORD OF AZRAEL by Matthew David Surridge — The format of the story was unusual, a series of summaries (which was intentional, the author going for the feel of Conan paperbacks which had summaries of Conan’s deeds in between books) but very engaging, in a single story the author builds both an interesting world and a fascinating history for that world. All in all a fine issue and several stories I’ll go back and reread. And I’m happy that Black Gate reads so well on the iPad (I admit I was a bit worried). Go out and buy this issue. Highly recommended.